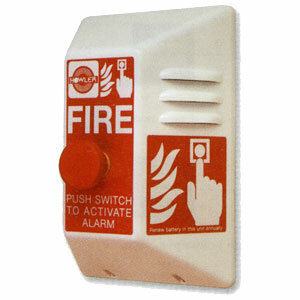 The Howler Site Alarm provides a rapid means of raising the alarm in an emergency. The Howler is designed primarily for building sites and other locations where a conventional fire alarm system is inappropriate. This Howler site alarm model incorporates a 50mm diameter palm-push switch, that is twisted anti-clockwise to switch off. The IP65 rated switch allows the Howler to be used in external applications.